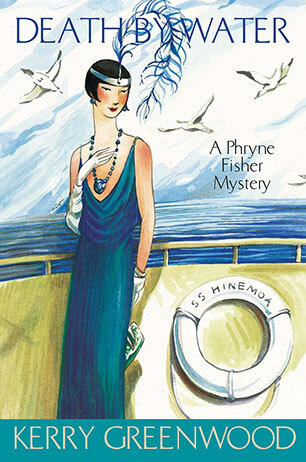 The divine Phryne Fisher returns in the fifteenth seductive instalment in the classic Phryne Fisher whodunnit series. The nice men at P+O are worried. A succession of jewellery thefts from first class passengers is hardly the best advertisement for their cruise liners, particularly when it is likely that it is a passenger who is doing the stealing. Phryne Fisher, with her Lulu bob, green eyes, Cupid's bow lips and Chanel travelling suits, is exactly the sort of elegant sleuth to take on a ring of jewellery thieves aboard the high seas - or at least, aboard the SS Hinemoa on a luxury cruise to New Zealand. With the Maharani - the Great Queen of Sapphires - as the bait, Phryne rises magnificently to the challenge. Kerry Greenwood is the author of twenty-seven novels and the editor of two collections. Previous novels in the Phryne Fisher series are Cocaine Blues, Flying too High, Murder on the Ballarat Train, Death on the Victoria Dock, Blood and Circuses, The Green Mill Murder, Ruddy Gore, Urn Burial, Raisins and Almonds, Death Before Wicket, Away with the Fairies, Murder in Montparnasse, The Castlemaine Murders and Queen of the Flowers. She is also the author of several books for young adults and the Delphic Women series.